This is one of the most beautiful representations of a Madonna and Child (Mary and Jesus) that I have ever seen. 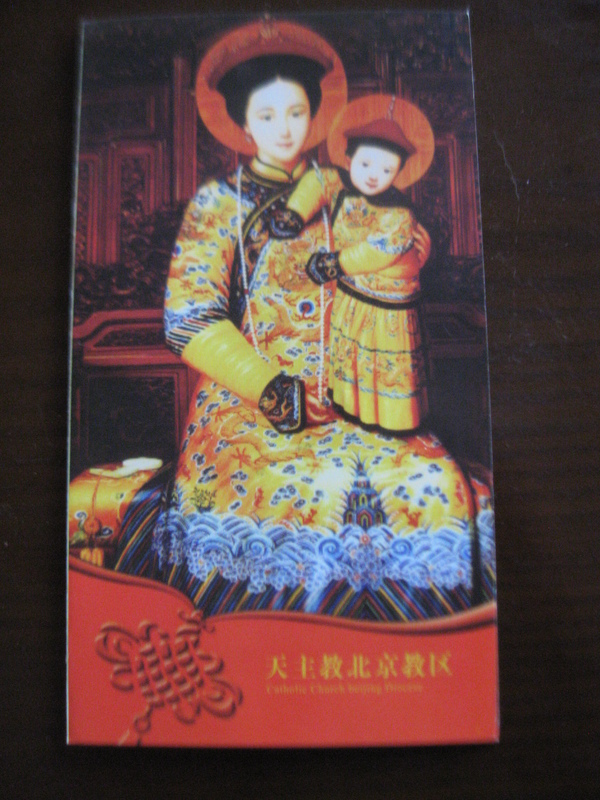 It was on the cover of a brochure for the Beijing Diocese, which I picked up at the church yesterday. Today, 22 August, took the new faculty members of the International Division to northwest Beijing, the Haidian District, for the health exam for our work visas and permits. This is the first time I have ever been in a van when the driver went intentionally down a one-way street — the wrong way, mind you — in order to shave minutes off a trip. No doubt our collective blood pressure, along with existential angst, was raised a bit at that point. Beyond that, all seemed to go well. Now, back at the apartment, I am working on my lessons for the first few days of school, which will be taken from Thomas Paine’s Crisis in America, a title suggested by my former middle-school student in Virginia, Tiffany F., who is now doing graduate studies here in China. In fact, she insisted I teach this. To be sure, as I am teaching American Literature, it fits in well, as it is a piece of Colonial writing of the first order, and it has the added benefits of teaching something about the American character and language. Thanks, Tirf!